SEOUL (Reuters) - South Korea's President Moon Jae-in said on Monday he will pursue "in earnest" another summit with Kim Jong Un despite the North Korean leader's recent criticism of Seoul's self-proclaimed role as a mediator in stalled nuclear talks. Moon has been eager to regain momentum in talks with North Korea since Kim's second summit with U.S. President Donald Trump, in Vietnam in February, failed due to conflicting demands by Pyongyang for sanctions relief and by Washington for sweeping North Korean measures to abandon its nuclear program. Kim said in a speech on Friday that he was willing to hold another summit with Trump if the United States changed its calculation and offered a "proper attitude and a methodology", setting a year-end deadline. While North Korea and the United States have been discussing the North's denuclearization, U.S. ally South Korea has been taking steps to improve its ties with its old rival. Moon and Kim have held three meetings over the past year, and Moon's administration has been keen for a fourth, possibly to mark the anniversary of the first one on April 27. Moon, who visited Washington to meet Trump last week, said Kim's latest address "set the stage" for a fourth inter-Korean summit, which could be a "stepping stone for an even bigger opportunity and a more significant outcome". "Now is the time to begin the preparations in earnest," Moon told a meeting with senior secretaries, noting that as soon as the North Koreans were ready, he was willing to meet Kim "regardless of venue and form". In his first public remarks since Kim's address, Moon said he "very much welcomed" that speech, saying it showed Kim's "unwavering" commitment toward denuclearization and the reopening of negotiations. 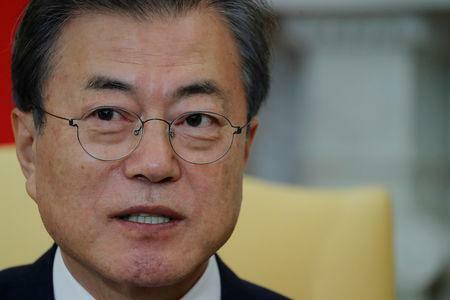 But Moon did not specifically respond to Kim's criticism that South Korea was too subservient to the "anachronistic arrogance and hostile policy of the United States", and that the South's military persisted in "veiled hostility" by conducting exercises with U.S. forces. Kim said South Korea should not "pose as a meddlesome 'mediator' and 'facilitator'" between the North and the United States. North Korea's state media on Saturday issued a commentary criticizing South Korea's purchase of fighter jets, including two recently delivered F-35A jets from the United States, calling it a "serious provocative act" that could intensify tension on the Korean peninsula. However, Kim said he remained committed to improving relations with South Korea if it showed its "sincerity by practical action, not by words". Any significant improvement in ties between the two Koreas could depend on progress between North Korea and the United States on the North's denuclearization and that looks doubtful, with neither side showing willingness to make concessions. Trump emphasized during last week's talks with Moon that he was willing to meet Kim again but would not lift sanctions until the North took meaningful steps to dismantle its nuclear programs.